This is the first group of RM5 being circulated into the public domain bearing serial number starts with AA. Both text were written in Jawi, a variation of Malay writing. 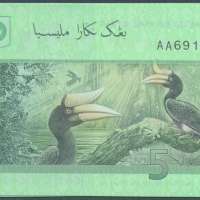 The reverse depicted two birds from the group of Rhinoceros Hornbill whereas the OLDER third series depicted Multimedia Super Corridor, KLIA and Petronas Twin Towers.